Jackie, Healthy Witness: I want that, too! ❤ 4 years ago, I watched many friends embark on a journey of health! I was so excited for them. I was already on my own journey losing about the same weight and sizes like they were. YAY! ❤ As I watched their transformation, I was curious.... what were they doing and why were they not financially strapped!? I mean eating healthier, getting healthier costs a lot of money! ❤ Then I realized, they were getting discounts on their nutrition and fitness tools, and making an income! I was like "SAY WHAT?! I WANT THAT!" 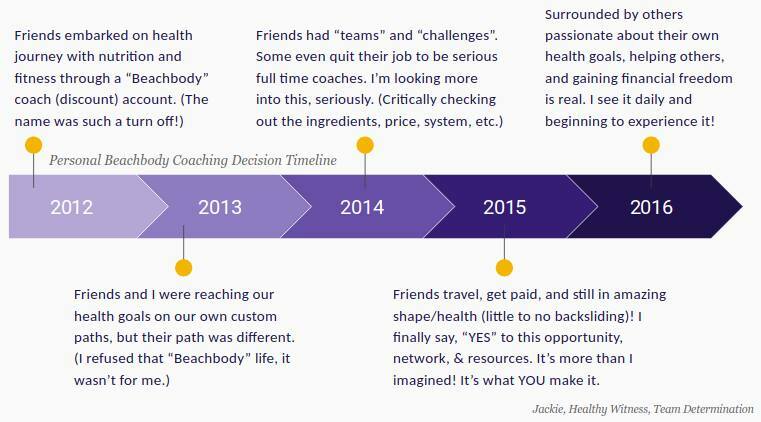 They were actually getting paid to help others, workout, drink daily super food shake (that took a fraction of the time I spent to make), and what seemed like a personal health journey - turn hobby - was turning into Self Employment, for my friends! ❤ They made their rules, their hours, and had freedom!! Freedom because they made THE BEST CHOICE EVER in 2012! ❤ In 2015, I finally said "Yes" to upgrading my passion for health, not just for me, but for helping others with more resources, and for potential income because we're short monthly (who isn't?). ❤ If you yourself want to see what this is all about, then I encourage you to reach out and join a LIVE SNEAK PEEK where "What is Coaching?" will be presented ... no strings attached, no commitments (show up, listen, and the rest is up to you). ❤ Message me to get information on the next one. Attendance is limited to keep the time brief with quality.